Leaves revealing fiery color and trees and shrubs molting to carpet the ground below. 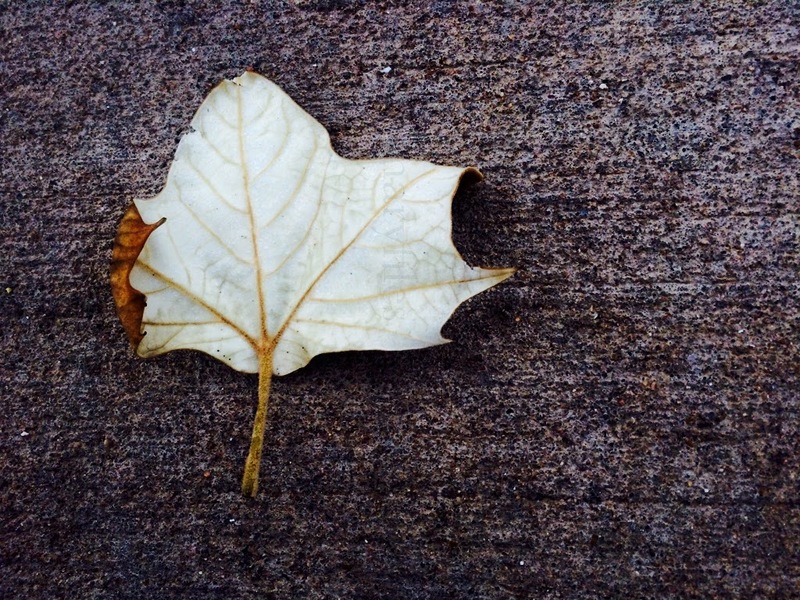 A chill suspended in the breeze as the days grow shorter and shorter and we set the clock back. Sweaters, scarves, and animal themed knit caps coming out of storage. A yearning for hot soup, steamed drinks, and pumpkiny desserts. And even for us in Austin, Texas, where the weather has just finally decided to downgrade from Summer-like temperatures, the change of season is still apparent in what's now plentiful at the farmers' market and in the aisles of the local grocer. From the melons, stone fruit, cucumbers, tomatoes, peppers, and berries of the Summer months, we now make way for apples, pears, persimmons, citrus, gourds, cruciferous greens, and root vegetables of Autumn and Winter. 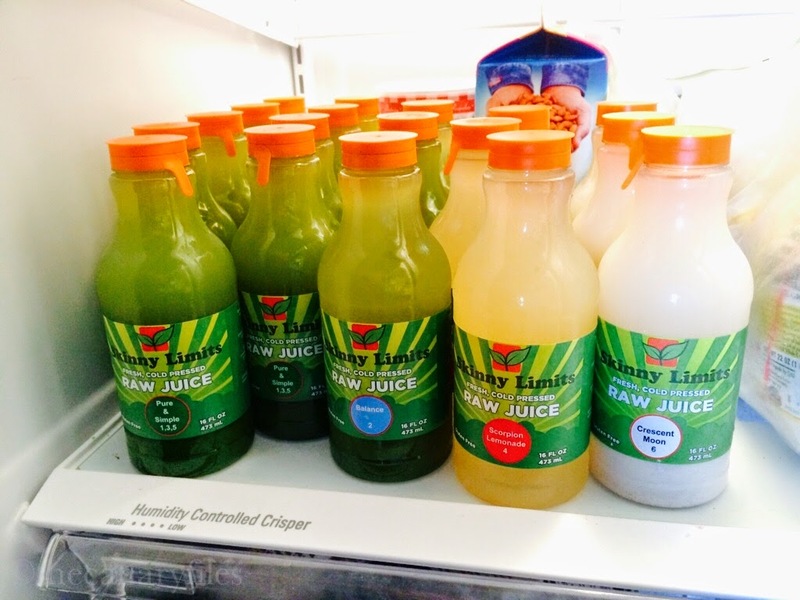 So what better time than for a juice cleanse? As nature around us changes, I feel it only "natural" that we should respond in kind - clearing away the old, what's no longer needed, to make room for the new and the way of eating and digesting that will be most useful for the colder, darker months. A juice fast/cleanse can be an effective way to achieve this end, where the body subsists primarily on juice from fruits and vegetables. It gives the digestive system an opportunity to rest, encouraging the release of toxins, the restoration of alkalinity as acidity and inflammation are reduced, and promoting balance for both metabolism and digestion, providing a fresh start for the body and mind. Lasting anywhere from less than a day to several weeks, the duration of the cleanse is totally dependent on the needs and goals of the juicer. 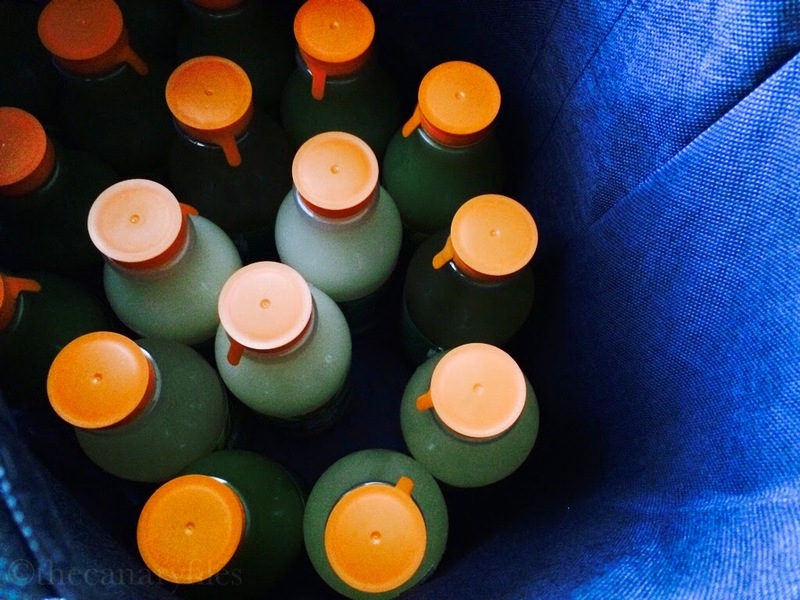 So, now that I've given you my general musings on juice cleansing, allow me to offer you the specifics of a 3-day juice cleanse I embarked upon. Skinny Limits, a local establishment specializing in raw, healthy, plant-powered meals to go, smoothies, and cold pressed juices, approached me about taking one of their juice cleanse programs for a spin and then offering my thoughts on it on The Canary Files. 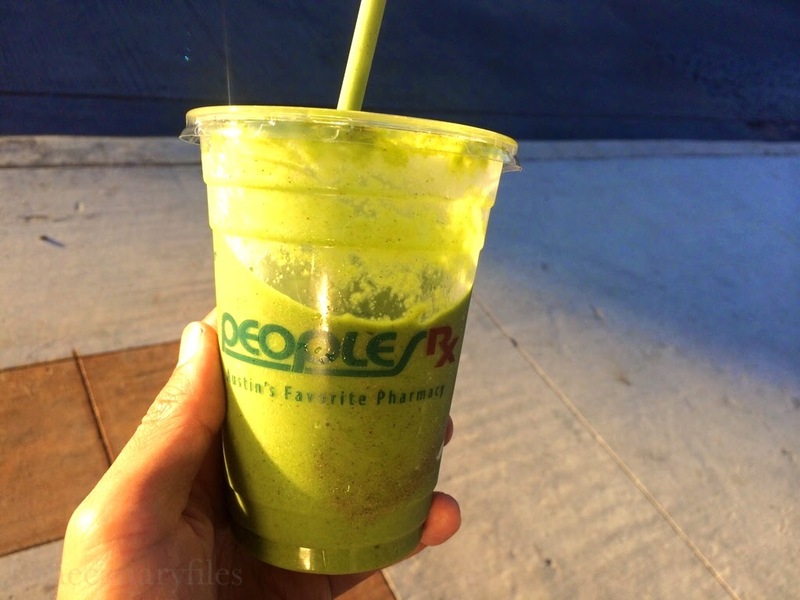 A "Kale Monster" smoothie for the bus ride home (because I'm that fancy). Now, I am aware that general thoughts surrounding juice cleansing is a mixed bag at best. The hilarious memes of someone starting a cleanse, extravagantly drinking a dark green juice because they're "oh-so healthy," and then finding themselves sequestered in the restroom...the awe-inspiring stories of people who have reversed chronic, and even terminal, illnesses and diagnoses…the complaints of headaches, body pain, dizziness, lack of energy, and feeling starved…those who discover a way of feeling good that was at one time inconceivable, transforming their bodies from the inside out. And the thing is, all of those things are possible depending on how you go about doing it. In a good amount of cases, the "negative" side effects are actually signs that the cleanse is serving its purpose and detoxifying your body (which, honestly, can be more "negative" for some). Which, I know, does not necessarily make the thought of a juice cleanse any less daunting. But do allow me to say, that from my own experience, that any initial discomfort can be well worth the outcome, which can last far beyond the final day of the cleanse. I completed the three day "Standard Cleanse," a regimen consisting of five 16 ounce bottled juices and one 16 ounce bottled nut milk to be taken daily. The first, third, and fifth juices of the day were the "Pure & Simple," a blend of kale, spinach, parsley, celery, cucumber, apple, and lemon. The second juice of the day was "Balance," which is the "Pure & Simple" plus ginger. The fourth was their take on the Master cleanse called the "Scorpion Lemonade," combining raw agave sweetened lemonade with a kick of cayenne. And the final drink of the day was the "Crescent Moon," a rich and sweet dessert like concoction of raw cashews, vanilla bean, cinnamon, raw agave, coconut oil, Himalayan sea salt, and filtered water. Being a very active person who is always on his feet and basically works out at the gym for his job, the thought of just having juice and water all day did spook me a bit. Way less than 2000 calories a day? Really? [insert blank stare and shrug] And while it would have been ideal to slow down and take it easy during a cleanse/fast, I did not find myself in a position to exercise that option. Before taking my first sip of the first juice on the first morning, I remember having a sinking feeling in my gut, wondering if I was making the right decision. But midway through that first day, I remember noticing how energetic, uplifted, and unexpectedly grounded I felt. The juices were easy to enjoy, tasting both sweet and substantial, and in appreciating their complexity, I did not feel the need to gulp them down. The exception to that was the "Crescent Moon," which some have likened to an horchata milkshake - I definitely needed to restrain myself a bit more with that one. And while I was anticipating that the second day would be more challenging, with the standard headaches, joint soreness, and weakness as the body began to detoxify, it actually became easier as the feelings of the previous day carried over along with a distinct sense of clarity and presence. There was no feeling of deprivation or lethargy, which was awesome. The final day was actually the most challenging, as I encountered a sudden outpouring of emotional energy that I was not prepared to handle/interpret/channel. And while this did make me feel agitated for a good portion of the day, it ironically did nothing to derail the feelings of connection and harmony between my mind, body, and spirit. My own personal detox apparently had more to do with my state of mind and the emotional "stuff" I was bottling up, and this outpouring, while not necessarily convenient, was definitely overdue. A phalanx of juices just waiting to be enjoyed. My verdict? I would definitely recommend. I really appreciated that all the juices in their cleanse programs are cold pressed, maximizing the juice's nutritive benefits and live-enzyme content. And beyond the product, which, to me, speaks for itself with its consistency and balanced flavor, there's also the very knowledgeable, friendly, and helpful staff providing service that offers the consumer peace of mind and assurance that they're making a wonderful decision for their bodies. And if you're not in Austin, worry not - they offer overnight shipping to get the juice to you stat. I'm already excited to try their other cleanse programs, particularly the "Earth" cleanse, which incorporates beets and carrots into the mix, and will definitely opt for an all organic cleanse (just $11 more dollars per day). 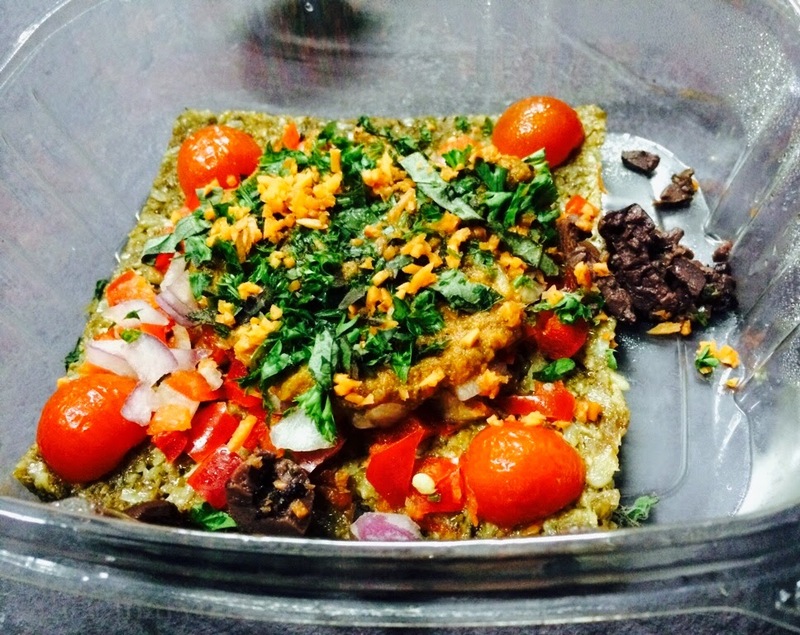 Raw, gluten-free, and vegan "pizza" that made me swoon. So, what would be my personal tips from me to you for a successful cleanse? Ease into and out of it. Your cleanse actually begins a few days before the actual "juicing" and ends a few days afterwards, so budget your time and your activities wisely. This is super important. In the days previous, begin simplifying your diet, cutting out meat, dairy, eggs, processed foods, and grains to streamline towards a veggie and fruit filled whole foods vegan diet. And after the body has had a chance to rest and recover during the cleanse, the last thing you want to do is slap it in the face by reverting back to your pre-cleanse diet. So just as you simplified your diet gradually, add solid and more complex foods back in slowly and mindfully to allow your digestive system sufficient time to adjust. Start your morning right. Every morning, your first drink should be a tall glass of room temperature water with a tablespoon of either fresh lemon juice or raw, unpasteurized apple cider vinegar. It sets up the digestive and detoxifying benefits of the cleanse and is a step not to be skipped. Sip, savor, and chew. In researching other cleansing programs, I came across the suggestion in multiple sources to "chew" the juice. Instead of drinking it directly like water, hold each sip in your mouth, and then move your jaws as if your were chewing to stimulate your salivary glands. Digestion, after all, begins not in your stomach, but in your mouth - enzymes in saliva begin working away at carbohydrates as soon as they enter the mouth. And with the concentrated nature of raw juice (there are pounds of fruits and veggies in each bottle) and all its potential health-restoring benefits, you should strive to avoid sucking it down and robbing yourself of the opportunity to extract maximum nutrients, as well as enjoyment, from the juice. I thought it was funny at first, but man, it really worked. It helped me to slow down, to really honor the vitality of the juice I was drinking, and to feel both satisfied and happy. Pay close attention. In depending on six beverages to sustain you through your day, you are offered the opportunity to see just how intimately connected your mental, physical, and emotional well being is to what you choose to eat and drink. Of course, it's not black and white, but there is definitely a causal relation. Bottom line: The amount of calories you consume doesn't matter if they aren't quality. If they're from food or drink that's so processed as to render it unrecognizable by your body, then there's little to no benefit beyond satisfying an emotional craving while still leaving you nutritionally empty. And when you encounter negative side effects, rather than run, I would encourage you to stay where you are and seek to understand them. Just like the emotional avalanche I experienced, what are your symptoms communicating to you about the choices you are making in living your life? Are there better choices to make in the future? Gratitude to Skinny Limits for reaching out to me and allowing me the opportunity to experience, enjoy, and ultimately feel enriched by one of their juice cleanses. I do hope that there's a good nugget or two of information or wisdom that you can take away from this that may help you make a more informed decision when it comes to embarking on your own juice cleanse adventure. And, as always, if you have any questions sparked by anything I've brought up here, please feel free to reach out to me via email. Change is in the air. Breathe it in. 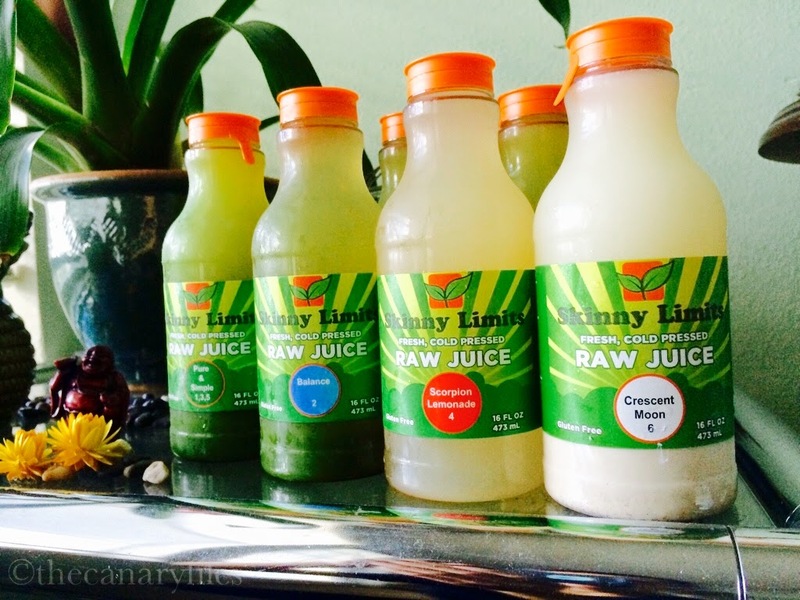 Full disclosure: Skinny Limits did give me their 3-Day Standard Juice Cleanse on the house and ask for a blog post/review, but I was never under any obligation to write with any given angle or agenda, either positive or negative. These are simply my thoughts, opinions, and nerdy commentary.